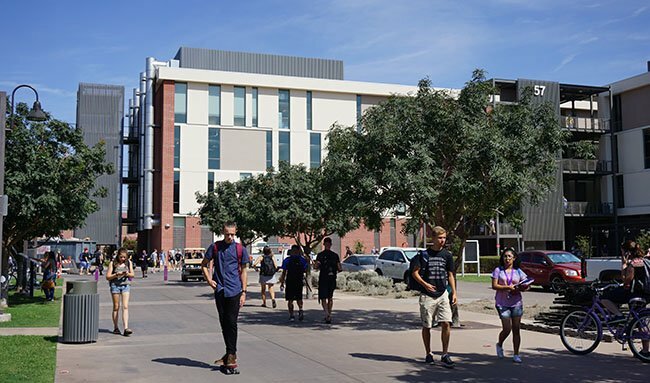 Grand Canyon University’s first engineering students begin their introductory STEM courses this week as they prepare for the more complex material ahead in their biomedical, electrical and mechanical majors. Hundreds of students attended classes in GCU’s new engineering building for the first time Monday, the start of the 2015-16 academic year. They will start at the basics as students from each of the three disciplines and others from the year-old computer science and information technology programs, learning foundational skills in design, computer programming and the team problem-solving taught in the freshman course, UNV-112, “Success in Computer Science, Engineering and Technology.” In two or three years, they’ll be deeper into physics, electromagnetics, thermodynamics, materials and preparing capstone projects. Everything about GCU’s engineering programs is new. The coursework is brand new, most faculty have been at the University for a year or less, and a new four-story engineering classroom building opened Monday on campus along Camelback Road. GCU’s growth is rapid, yet the University is focused on creating academic programs that equip students for jobs right out of college, which is relatively out-of-the-box in mainstream engineering academics. Additionally, GCU has pioneered a host of K-12 STEM preparation programs to further develop the Valley’s high-tech workforce, including the tuition-free STEM Scholars program, which saw its first group of high school students complete a GCU biology course and earn college credits this summer. Dr. Michael Sheller is excited about introducing the concept of Christian anthropology to GCU’s engineering students as they navigate their studies. Dr. Michael Sheller, a longtime biomedical engineer and entrepreneur, joined GCU last year as associate dean of the engineering programs for the College of Science, Engineering and Technology. 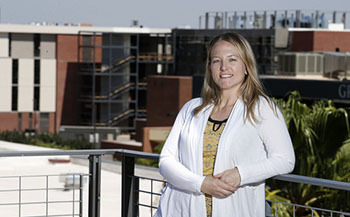 Led by Dr. Michael Mobley, executive director of GCU’s Center for Integrated Science, Engineering and Technology, and associate director Haley Peebles, the University spent months gathering feedback from leaders of Arizona technology companies. Together they then designed programs to be more hands on than those at larger schools where students often find themselves in lectures that limit the hands-on practice they get in their undergraduate experience. At GCU, students will be introduced to engineering principles in short 3-5 minute presentations followed by activities designed to engage students in their classroom labs – experiments, problem solving, modeling and simulations. Getting the students working together and considering the interdisciplinary overlap of their programs is part of GCU’s challenge. And because GCU is a Christian university, UNV-112 also will introduce concepts of Christian anthropology, the study of humans as it relates to God and spirituality, he said. Students will learn to critically think about whether advancements in science and technology, to create the perfect heart, skin, eyes and brain, for example, should be blindly embraced. Additionally, students will consider the incarnational aspect of our humanity by delving into virtual reality and other Internet features that seem to eliminate the physical person, rather than valuing it, Sheller said. With that Christian worldview in mind, UNV-112 will include a project where students will develop and program a robotic hand that they will manipulate with basic circuit boards to make the fingers move, hand turn and — with some practice — shape a “Lopes Up” gesture. Phoenix engineering entrepreneur Tim Stippick, who grew up in west Phoenix and sits on GCU’s Engineering Advisory Board, designed the robotic hand prototype over the summer. It consists of more than 20 parts and a pair of six-volt motors, which are about the size of a piece of bubble gum. He got involved with GCU through Sheller, with whom he recently authored an academic journal article about combined magnetic fields for spinal fusion sites, which examined the healing effect of electromagnetic bone growth stimulators used to promote recovery from spinal surgery. Sheller and Stippick had also worked together on biomedical devices in the past. Students in the UNV-112 course and lab will learn the components of basic breadboard circuit boards, learning about resistors, LEDs , transistors, and limit switches which are “the things that will tell you if something is on or off,” Stippick said, adding that those transistors provide the logic for the robotic hand. Students will control it by using a C-program, and they’ll learn “where solid materials and electrically controlled processes overlap,” Stippick added. Sheller and CSET Dean Dr. Mark Wooden hired Dr. Melissa Trombley to oversee the electrical engineering program. Trombley began consulting for GCU earlier this year on curriculum development and joined CSET full-time this summer after 10 years at Intel. Trombley said the equipment GCU is planning for its engineering labs will help students understand the technology they’ll be dealing with in their careers. 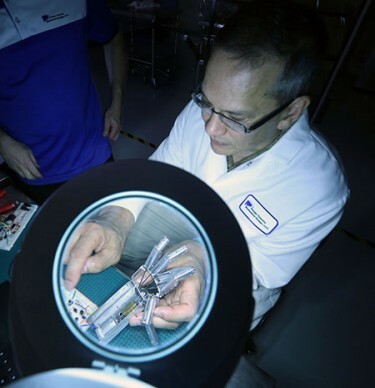 She said they’ll learn, for example, about detail-oriented metrology, the science of measurements, by practicing with the same type of microscopes and optical devices they’ll see in industry. Also, GCU engineering students will be exposed to the regulatory standards that engineers at all levels must grow accustomed to as they start their careers. Sheller said introducing students to those standards earlier in their program was a key goal in the development of the new biomedical engineering program.